Chantel is an award-winning photographer with a passion for Australian wool, both for the fibre, the sheep and life in rural Australia. A passion inspired through working with wool as a master classer, classing and handling wool in outback Queensland. Living and working with people on the land has created a connection that resinates within Chantel’s images. Each encapsulates a story that portrays the essence of life behind the image, one that draws the viewers senses to see and feel the life of Australian wool beyond the image. At baregamerino we were privileged to meet this passionate young Queensland photographer, Chantel McAlister of Chantel Renae Photography on her journey about Truth About Wool National Tour 2017. We met on a clear sunny Tasmanian winters day on the 7th June 2017 and talked about Australian merino wool, merino sheep and our individual journeys that are a part of Australian Wool. We ask Chantel some questions about the tour both for her personally, professionally and for Australian wool. What is the main purpose or aim of the National Tour 2017? The aim of The Truth About Wool Campaign is to first of all promote the wool industry and educate others on the wool growing and harvesting processes. Not everyone is able to just pop down to their local sheep property and learn how it all works, so through my photography and videos I am bringing our world to them. It’s also about giving a bit of recognition to the dedicated people contributing to the Australian wool industry. Where did the inspiration for this project come from and how did it evolve? I have always documented my life in the wool industry with my camera, so I feel like my campaign for wool actually did start many years ago. It wasn’t until I had developed my photography skills further and had a deeper understanding of the wool industry that I took it to a larger scale. The campaign started in early 2016 with a video demonstrating crutching at my home property, ‘Sutton Grange’ in Queensland. It was an educational video on the process and it was well received in the online community. From there more videos were released and each had a larger reach. Growing up in Brisbane, I can appreciate how the wool industry can be wrongly perceived as I had done so myself, for most of my life in the city. My only exposure to the industry had been petting zoos and sensationalised imagery from animal activist’s groups. I draw on my former (city) self to inspire my work and try to put images and information out there that I think would clear up any the misconceptions I used to have. What has inspired you the most on your journey to date? I would have to say woolgrowers. Only ever seeing the industry from a shearing team point of view, I had never taken a really close look past their farm gates and realised just how much of their lives they dedicate to their passion of growing wool. They don’t think twice about the time they invest into their jobs and it’s incredible how many don’t even view what they do as a job, instead a lifestyle. There are no ‘weekends’ or ‘holidays’ just working towards their next goal. Their drive to constantly keep their flock moving forward to keep up with consumer demand is tireless and admirable. It’s so much more than just putting sheep out into the paddocks until the next shearing time, it’s constant research, development and care. Have you found a previously unnoticed or understated message that needs to be expressed? We all know that farming and harvesting wool is hard work, but I don’t think most people know how personal the wool story is. So many hands go into making a wool garment and each pair of hands has their own story to tell. It’s a story of resilience and passion and the only fibre in the world that can boast this. These stories need to be told. It’s the story of Australia’s past and indeed, our future. Wool is not only an investment in your wardrobe, it’s an investment in rural communities and families. It’s an investment in rural Australia. Have there been any surprises for you along your National Tour 2017 and what are they? I had always heard that the wool industry was a little diverse from state to state, however had never been able to experience it all for myself. What one state struggles with, like the war on wild dogs in Qld is virtually non-existent in another state like Tasmania. But then Tassie deals with things that is almost unheard of in Qld like footrot. What learnings have there been for you personally, professionally and perhaps Australian wool along the way as you see it? I naively didn’t expect the tour be a learning experience for me, but it has challenged me constantly and opened my eyes and mind to a whole new world around me. I am not well travelled, in fact the furthest I had ever strayed from Qld was NSW before the tour started. So, going out on my own and finding my way around such a huge country has been challenging and a little scary at times but rewarding all the same. I’ve learnt a lot about my limits, physical and mental and how far I can push them. Professionally I feel like I am always growing. I am a self-taught photographer so I don’t mind going the long way about things if it means I can teach myself. I can see that my photography has evolved a little from the start of the tour and has taken a slightly different direction. I focused heavily on the sheep and art of shearing before the tour, but the more I uncover that people working in the wool industry have an emotional connection to it, the more I try to portray that through my photography. Where to from here for Chantel of Chantel Renae Photography, what do you aspire to? I feel like The Truth About Wool National Tour is like a fact-finding mission, gathering images, stories, information on the wool industry. Almost like it’s just the start of what’s to come. I have plans to publish a book of the tour in 2018 and later take this on the road to metropolitan areas to educate city dwellers face to face about the industry. My vision is to hold a touring exhibition that has hands on displays of wool, sheep and wool products and speakers from within the industry educating them on their role in wool. 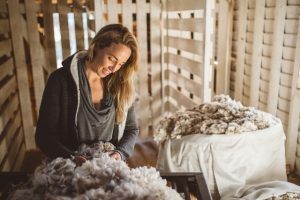 The aim of this would be so visitors may be able to experience a woolshed first hand, make a personal connection with wool and clear up and misconceptions they may have about wool growing and harvesting. Chantel’s passion of wool as a master classer has energised her to reach out and journey in search for the true meaning of wool in rural and remote Australia through the art of photography. Through photography, Chantel’s seeks The Truth About Wool reflecting in the lines on the faces of people she meets, capturing moments in time of the expression of sheep and the dynamic landscape across Australia. Together through impressions and imagery, Chantel’s journey will inspire all to the truth about wool, a reflection of the diversity, of resilience and courage of all those whose connection with Australian wool is part of their daily life.